When you stay at All Ritmo Cancun Resort & Water Park - All Inclusive in Cancun, you'll be on the beach and convenient to El Meco Archaeological Site and Gran Puerto Pier. This all-inclusive resort is within close proximity of Punta Sam Ferry Terminal and Séptimo Día Adventist Church. Make yourself at home in one of the 155 air-conditioned guestrooms. Rooms have private balconies. Wireless Internet access (surcharge) keeps you connected, and cable programming is available for your entertainment. Bathrooms have shower/tub combinations and hair dryers. Don't miss out on recreational opportunities including a complimentary water park and an outdoor pool. This resort also features wireless Internet access (surcharge), gift shops/newsstands, and wedding services. Satisfy your appetite at one of the resort's 4 restaurants. Relax with a refreshing drink from a bar/lounge or one of the 2 poolside bars. 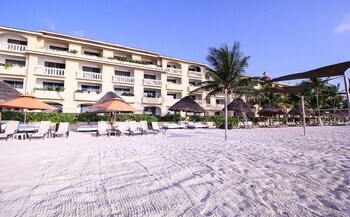 All Ritmo Cancun Resort & Water Park is an ideal Cancun lodging choice for your trip to Mexico. With numerous amenities for guests such as 24 hour front desk, gift shop, tennis court, you will wake up at All Ritmo Cancun Resort & Water Park feeling invigorated every day for your time in Cancun. Don’t let this amazing reservation opportunity pass you by, book your stay at All Ritmo Cancun Resort & Water Park today to make the most of your time in Cancun, Mexico.